On May 15, the government of British Columbia announced the Greenhouse Gas Regulation to promote the adoption of natural gas vehicles in the province. As a global leader in natural gas vehicle (NGV) engine technologies headquartered in BC, we realize this is not only an endorsement from our own government of the potential for NGVs to reduce greenhouse gas emissions, but also in the shift towards cleaner burning fuels. While BC is already home to several organizations with natural gas fleets - such as Vedder Transport and Waste Management, - this program may be the catalyst for more fleet conversions in the province. The program not only offers incentives to transportation fleets wishing to adopt natural gas, but it may also increase infrastructure whose current lack is a barrier to the greater adoption of NGVs. This new incentive program, administered by FortisBC - gives businesses in the province a chance to capitalize on a domestic ‘home-grown’ fuel that the global marketplace is increasingly demanding. 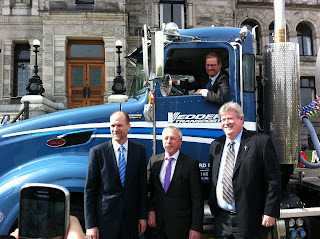 We look forward to seeing the roll-out of this Greenhouse Gas Reduction incentive program and to BC businesses enjoying the advantages of adopting natural gas as a transportation fuel.